Four new barns will be built in 2016. Story here. This is how many factory barns there were in southeastern Manitoba in 2007. That's when the Clean Environment Commission warned that more industry growth would lead to "a significant increase" in the production of nitrogen and phosphorous, nutrients which contribute to the pollution of waterways. So....just how many are too many? Cutting edge of technology is a joke. In 2011, after lengthy studies by renowned scientists were released on the situation of Lake Winnipeg waters, the government decided to take a stand. This resulted in Save the Lake Winnipeg Act, Bill 46. This act was implemented in June 2011. A portion of the act included the requirement for any new barns to have appropriate cutting-edge technology, as a treatment of manure, to assist in reducing the phosphorus that was promoting algae grow. This “cutting edge of technology” now under consideration, is digging two large holes into the ground for retaining hog faeces. Is this a joke? 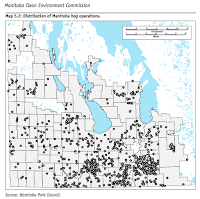 Previous studies carried out and reported by Manitoba Conservation have determined that these installations leak, and therefore are a threat to our surface and groundwater source. An Open letter to the Premier of Manitoba. Firstly, I wish to thank you for the openness of your letter, ( WFPress,18 Feb.20-16 ) and the comments that you shared with all Manitobans. You can rest assured as stated by Theodore Roosevelt…"The only man who makes no mistakes is the man who never does anything." Secondly, myself and all Manitobans would be negligent not to question the sanity of any government which shells out OUR tax dollars which supports an industry that contributes to social disruption and pollution. In your letter, you mention…"We're standing up for future generations with strong environmental actions, and protecting our lakes." 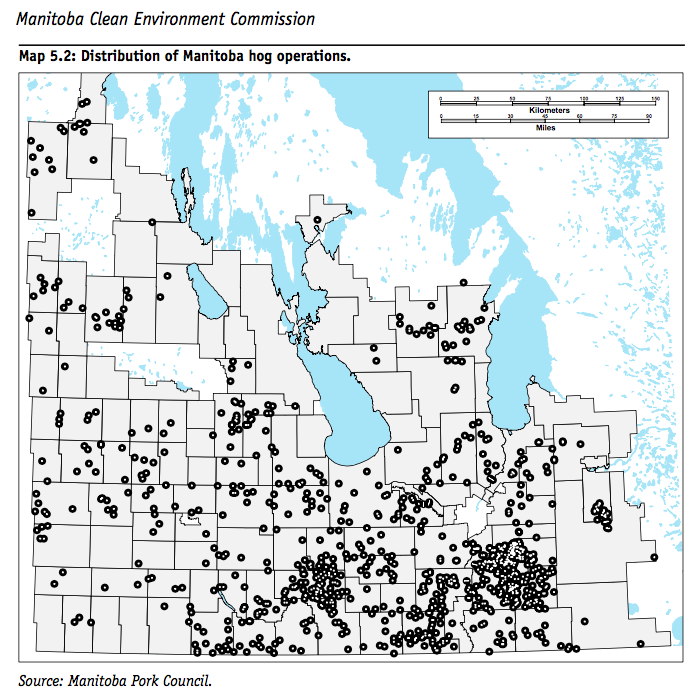 Further in news media, it is reported, Manitoba NDP Promises Environmental Bill of Rights. This endorsement seeks protection, of the right of citizens , for a clean environment, that is: clean air, and clean water and fully functioning ecosystems that provide services to nature and humans. A noble undertaking, indeed. The reason that I bring this to your attention Premier, is this. You, yourself , at a news conference in June of 2011 had this to say …. "Research shows hog manure is the biggest single risk to Lake Winnipeg"
The cutting edge of technology as was stated in Bill 46 (Save the Lake Winnipeg Act) has now been reduced to digging two holes in the ground to store hog feces; this plus the fact that such earthen storages leak, as determined by Manitoba Conservation, will invariably be a further pollution threat to our ground and surface water sources. Premier Selinger, your personal envisions, hard won accomplishments and dedicated work efforts over the past several years to protect and save Lake Winnipeg and our Manitoba water sources are now being compromised. Manitobans are being duped! Are your ministers aware of this, or is this for the benefit and Hope of the Hog Industry? With proposals like this, it's little wonder that our water sources are polluted and even more threatened. Lake Winnipeg is in a crisis. Manitobans need better protection and better planning. For, as you have stated…"Your health and the health of your loved opens is our top priority". I urge you to keep and maintain your promises.